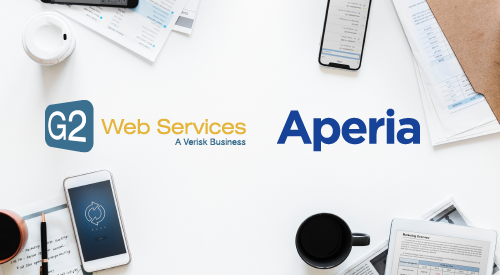 G2 Web Services and Aperia announced a collaborative integration program to help detect transaction laundering quicker and more efficiently. This means acquiring banks can now onboard merchants more rapidly, increasing revenue while placing less strain on their compliance teams. The secret — Datafusion™. Datafusion™ is a combination of acquirer, issuer, and gateway data. By carefully aggregating this information we can detect illegal test transactions more rapidly, uncover laundering networks more extensively and disrupt advanced crime networks more efficiently. G2 started with the Merchant Map™, with intelligence on 120 million websites from over 15 years. Last year, after our acquisition by Verisk, G2 added data from Argus Information, which analyzes 95% of credit card transactions. Now, G2 has formed a partnership with Aperia, which offers fraud solutions trusted by over 150 processors, ISOs and banks. Together, we have developed Datafusion™. Recently, G2 and Aperia unraveled a laundering scheme selling prohibited CBD, also known as Cannabidiol, a derivative of cannabis. Read the full case study and learn how Datafusion™ is the future of merchant risk intelligence. G2 Transaction Laundering Detection has been chosen by more banks and payment service providers than any other solution because of G2’s “defense-in-depth” approach. The CBD syndicate described above is one of many criminal rings revealed. G2 Web Services and Aperia will be showcasing Datafusion™ as well as transaction laundering detection, risk and compliance solutions at ETA TRANSACT this week in Las Vegas. Visit G2 Web Services in booth #936 and Aperia in booth #645 to learn more.